Looking for the perfect book to buy someone? 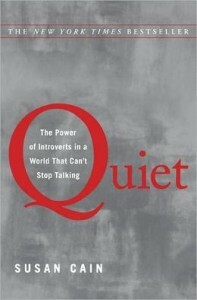 I highly recommend Quiet: The Power of Introverts in a World That Can’t Stop Talking by Susan Cain. The author provides a fascinating and quick read about the experiences of introverts in an extroverted world. This book is a great gift for both introverts and extroverts alike – each can learn something about the other, and how to communicate better with each other, by reading this interesting and at times humorous book. As an introvert working in a profession dominated by introverts, I found it very helpful to think about how extroverts might tackle many of the daily challenges that I face at work. And for extroverts, this book would provide insight on introverted approaches to problem solving – there are some advantages to the introverted approaches. And if you want to give yourself a gift, check out the book at your local library!